Reach Chennai. Pick up from airport at 07:30 Am.visit half day sightseeing of Chennai including temples and museum then proceed to Pondicherry surface approx. 200 kms. On arrival check in hotel and evening enjoy the Pondicherry beach. Overnight at the hotel. Morning after breakfast visit Shri Aurobindo Ashram which is famous land mark of Puducherry. This Ashram is very famous for Yoga Meditation teachings. Also visit Auroville, Botanical gardens, Church of Sacred Heart of Jesus, Pondicherry Museum, French Institute of Indology and Bharti Dasan Memorial Museum. In the evening relax at the hotel. Overnight at hotel. Morning after breakfast proceed to Kanchipuram by surface approx. 124 kms.on arrival check inn at hotel. afternoon visit Shiv Kanchi temple and Vishnu Kanchi temple. Evening at your leisure. Overnight at hotel. Morning after breakfast depart for Chennai surface approx. 74 kms. 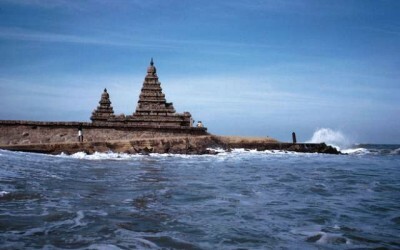 En route visit Visit Shore temple – classified as a UNESCO World Heritage Site, Arjuna Penance and Five Rathas at Mahabalipuram. Afternoon reach Chnnai drop to airport or railway station for your onward journey.Check inn at hotel.